Stephen Sullivan is an Irish stem cell researcher working in the USA. He is a strong advocate for embryonic stem cell research in Ireland, and all the other types of stem cell research. He is passionate about his work, and believes stem cells have the capacity to alleviate human suffering. However, looking at the Irish situation in particular, he says he is disturbed that there are no laws governing stem cells. This creates the impression he says, that Ireland, as in its financial matters, is like the ‘wild west’ – a place where laws, if they exist, are ignored. Stephen Sullivan grew up as the youngest child in his family by 10 years. A curious boy, he became well used to asking questions of the older people around him that seemed to know much more. One of those people that knew much more was his Dad. Stephen had a great relationship with his father, and recalls having long chats with him about all kinds of things. They were both “ideas junkies” as Stephen describes it. Meanwhile, Stephen’s eldest brother helped to pique an interest in ideas, and the nature of the world around him, by having a simple light microscope present in the house. Stephen recalls looking at pond water under this microscope and being amazed by the diversity of life he could see in it. Though there were no scientists in the family there was plenty of education and learning about, with surgeons on his mother’s side, and psychiatrists on his Dad’s side, he says. Stephen went to primary school in Beaumont Boys School, and secondary school at Ashton multi-denominational school, both in Cork city. He recalls the influence in primary school of a series of books called ‘Out and About’. These were nature education books that described everything from bird migration to the life cycle of the salmon. That helped stimulate the interest in science that was growing in his young mind, as well as nature trails when the teachers explained what frog spawn was, and how trees lost their leaves. He was well and truly hooked on science by the time the leaving certificate rolled around, and he took all three main science subjects, physics, chemistry and biology. At that time, he enjoyed the fun of the chemistry lab, but biology was less appealing due to the lack of practical work, and the ‘learning by rote’. However, perhaps his most important ‘school days’ experience was his exposure at Ashton to people from a variety of cultures, creeds and classes. He looks back and says that, Ashton felt more like what he felt a university should be – a place to learn from others and exchange ideas – than UCC did later on. The influence of teachers was crucial, as is so often the case and he found that he did best in classes where the teachers were in love with their topics and there were several science teachers at Ashton in love with science. After an undergraduate degree at UCC, Stephen took a Masters degree at TCD. Then 1997 came, and the news that human embryonic stem cells – cells that are typically taken (with consent) from the excess embryos left over after IVF treatments – had been isolated for the first time. It was also the year that the world was introduced to ‘Dolly’ the sheep that had been cloned in Scotland. These developments had a huge influence on Stephen and he saw immediately that stem cell research – where cells could be reprogrammed in the lab to become other cells – could be used as a new tool to combat disease. 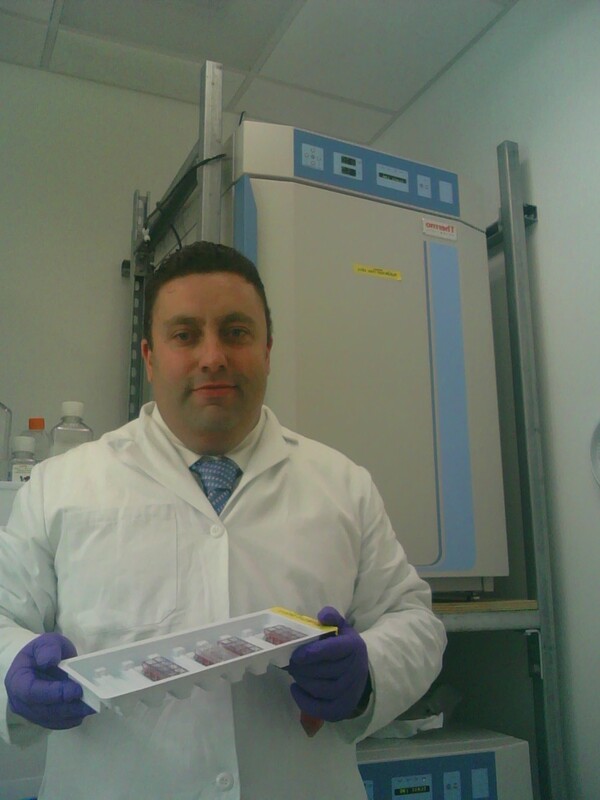 He was determined now to do a PhD in stem cells, and he was also determined to do it at the lab that produced ‘Dolly’. He achieved that goal, to his great credit, due to what he calls his “natural stubbornness” and was accepted into the lab of the now world-famous scientists, Jim McWhir and Ian Wilmut at the Roslin Institute in Edinburgh. At the Roslin, he became aware, he says, of how science is so often misrepresented in the media, sometimes to a ludicrous extent. Like one story that reported that ‘Dolly’ had eaten several shepherds as well as Ian Wilmut. This planted a seed that science, and stem cells needed to be better explained to the public, and that this side of things was crucial to the well-being of the field. His career was now firmly on an upward curve, and after Roslin, he went to Cambridge, and then to Harvard in Boston. He learned all about the famous competitiveness of students at Harvard, but managed to avoid getting ‘burnout’. A return to Ireland was always on the agenda, but he became frustrated with the lack of legislation governing stem cells here, the political apathy, and the splurging of funds into stem cell work that he considered of dubious quality. The situation in Ireland did not impress serious scientists looking in from abroad, he said, and made a mockery of the strategy of funding world-class science here. He tried in vain to get a research group off the ground, but no proposal that even mentioned ‘embryonic stem cell research’ had a hope of getting funded. The politicians had no inclination to get involved in a row over funding research on human embryos, which would provoke fury in some quarters. He decided to set up the Irish Stem Cell Foundation, along with other scientists, medical doctors, and bio-ethicists. The idea was to better educate people about stem cells, to advocate for all kinds of stem cell research here, and to push the law-makers to follow the UK, and introduce clear ‘stem cell laws’. Meanwhile, he moved to the US, as he could not get support for the research he wanted to do in Ireland, and took at post at the California Institute for Regenerative Medicine. There he is simply let get on with his research, without worrying about politics. He is working, specifically, on finding new stem cells, in particular trophoblast stem cells. These are the cells that make the placenta. The ultimate goal of this work is to develop better drugs and treatments for disease. It is very important to follow one’s own gut instinct when choosing a career, and to study subjects in university that you love, rather than have the points for, advises Stephen. This approach will lead to more happiness in life, he says. His parents had bee ‘instructed’ to take careers in certain professions, and perhaps for that reason, says Stephen, they reacted against that pressure and told their own children to do follow their passion when it came to a career choice. The basic rule, he says, is that if you love science, you’ll probably be good at it. “The points system and peer pressure can make people take choices not based on their innate abilities and interests, and that is a big mistake,” he advises. “You have one life, do what you like to do rather than what the system tells you, you have enough points for,” he adds. One of the best things about being a scientist is that there is no reason why a scientist can’t work, and be very good at their job well into their 70s, says Stephen citing the example of Dame Anne McLaren, a lady who was in her 70s when he was working with her, and still “as sharp as a pin, and a great teacher as well as a superb scientist”. Science is also one of the professions, he says, where it is possible to literally change the world. To make his point, Stephen said that he suffered badly from asthma between the ages of 7 and 15, but that his life was massively improved by an inhaler that could clear out his lungs. This demonstrated to him, at any early stage, how science and medicine can alleviate human suffering. There is also the novelty factor – good for intelligent people that bore easily. Every day, says Stephen there is something new, and there is always the prospect of doing something in the lab that no-one has tried before. That’s and exhilarating feeling, he says. What are the aspects of the job he doesn’t like as much? He says that he doesn’t like replying to correspondence from patients and their loved ones asking about where research currently stands in relation to the available treatments for injury and disease. At the moment, the answer is often that research has not yet gone far enough to actually provided ‘cures’. But, if Stephen gets his way that will change some day in the not-to distant future, and researchers in Ireland will be helping to make it happen. Previous Can science explain stigmata? Nuclear power for Ireland? It is very true that you need to follow your gut when it comes to choosing your career. It always seems when you do that everything turns out ok.